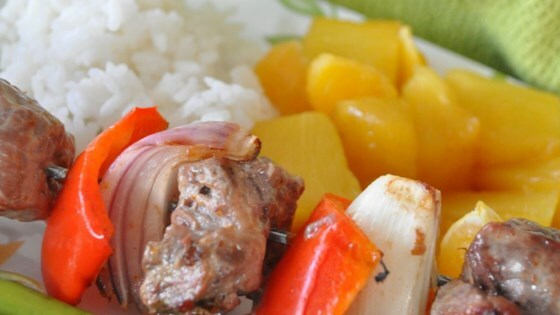 "Sirloin kabobs marinated in zesty citrus, combine with warm sweet foil pack grilled orange and pineapple. Serve over rice." Combine yogurt, cayenne pepper, ginger, orange zest, and sirloin cubes in a large freezer bag. Massage bag to mix and coat beef well. Refrigerate for at least 2 hours. Preheat an outdoor grill for medium heat, and lightly oil the grate. Remove beef from freezer bag; shake off as much marinade as possible. Thread onion, red pepper, and marinated beef cubes onto skewers; brush with olive oil. Place the pineapple and oranges in the center of a large piece of heavy duty aluminum foil. Dot with the butter, sprinkle with brown sugar, and drizzle with the rum. Bring together the long sides of the foil and seal well; fold up and seal each end. Place fruit packets on grill and cook, covered, for 10 minutes. Place kabobs on the grill with the fruit. Cook, turning occasionally, until meat is done to your liking and fruit is soft and glazed, about 10 minutes. .The nutrition data for this recipe includes the full amount of the marinade ingredients. The actual amount of the marinade consumed will vary.